How Do I Know If My Games Are Updated for Xbox One X? Note This video is available in English only. 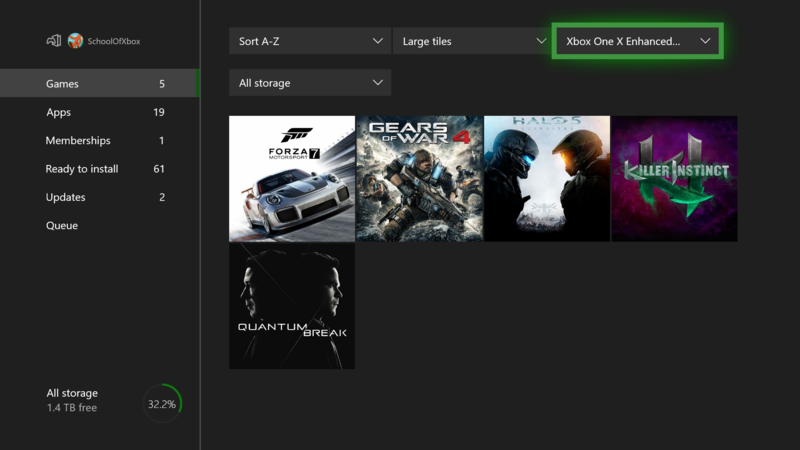 Press the Xbox button to open the guide and select My games & apps. In your games list, set the filter for Xbox One X Enhanced. Games that show here have been updated. If you set your Xbox to automatically update games and apps in Settings > System > Updates, your games will be updated as new versions become available. If a game hasn’t been updated, the update is either unavailable or not installed. The fastest way to update a game is to make sure you’re online, then launch the game. To find new Xbox One X Enhanced games on your Xbox, go to Store, select Browse games, and scroll to Xbox One X Enhanced. On phone and PC, you’ll find a list of Xbox One X Enhanced games at xbox.com/enhanced. Would you like to contact Support regarding the "How do I know if my games are updated for Xbox One X?" issue you were reading about or a different issue?